Add up to twice the natural light to any room in your home. Create panoramic views of your yard and garden. Enjoy your favorite plants conveniently at your fingertips. BROWSE OUR ATTIC FOR BIG SAVINGS! A beautiful custom wood garden window designed and manufactured by Renaissance may be the perfect finishing touch for your kitchen make over, home remodeling project, or soon to be built dream home. When you think of a plant window or greenhouse window, what often comes to mind are the vinyl garden windows sold at lumber yards, window and door specialty stores, and big box stores such as Lowes and Home Depot. These vinyl or aluminum window greenhouses all seem to be relatively plain in appearance and are typically available in a limited number of standard sizes and colors. If you have a bit more in mind for your home, Renaissance has the expertise and talent to build your garden window to be as beautiful as your home! As you browse through our garden window web pages, we trust you will agree that Renaissance windows can be uncommonly beautiful, extraordinarily durable, and will always be carefully crafted to be a stunning complement to your fine home. Whereas most stock vinyl garden windows are �shoe horned� onto your home, a garden window from Renaissance will be custom crafted to perfectly fit your special needs and desires. - Every Renaissance garden window is always built to-order. 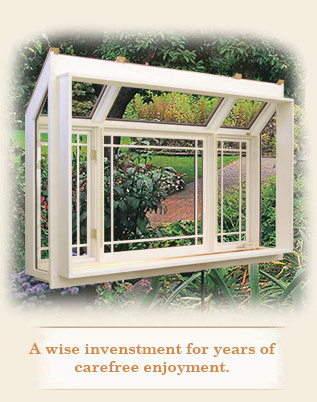 The sizes illustrated on our Garden Window Pricing & Order Form are for guideline pricing purposes only. 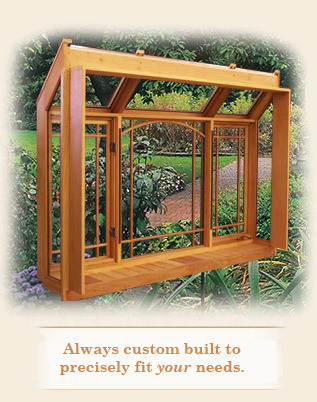 We will custom build your garden window to the exact size you need, for the same cost as the nearest larger sized window. If the size or layout of your dream garden window isn�t on our Garden Window Pricing and Order Form, call us and one of our Garden Window Design Professionals will guide you through the easy step by step process. 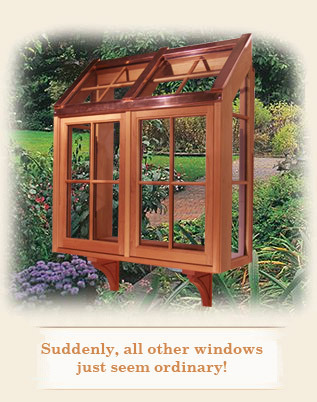 - Renaissance garden windows are built from beautiful and naturally durable wood, including Honduran Mahogany, African Mahogany, Cedro Mahogany, Cedar, Red Oak, White Oak, Maple, Cherry, and others. 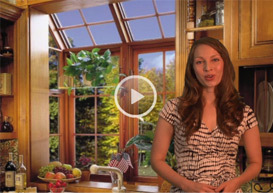 The interior of your garden window can be stained or painted to match your kitchen cabinets or windows. 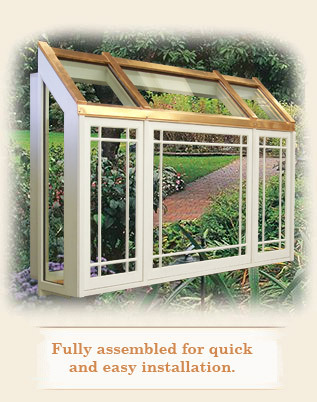 - Our garden windows are glazed with high performance insulating glass. We will recommend specific glass combinations to fit your climate and orientation, enabling your garden window to give you year round carefree comfort. - Our Kitchen Counter Top Extension feature is one of our most popular options. With a few clever changes to the base of your window, you can seamlessly extend your new kitchen counter into your garden window. Benefits include an enlarged window opening for added natural light and enhanced views, easy counter clean-up, and a dramatically unique finish for your new counter top. If you new counter tops are part of your kitchen remodel, be sure to ask us about our Garden Window Kitchen Counter Top Extension option. 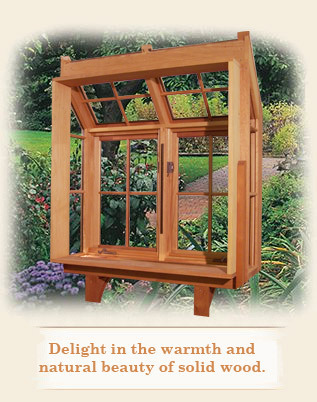 - Would you like a picture window in your garden window? No problem. If you have the available space, we will design your garden window with a wide picture window like opening to capture spectacular views of your lawn and garden. - Do you have a traditional home? Tell us what you�d like, and we will tailor your garden window to complement your Colonial, Tudor, Edwardian, Victorian or Mediterranean architecture. We�ll include architecturally appropriate divided lites, appliques and leaded art glass. 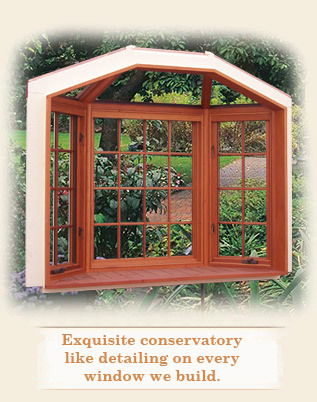 Since Renaissance garden windows are solid wood, they can be stained or painted to match the windows in your home. For an added touch of history, your garden window caps and flashing can be copper, lead coated copper, or pre-finished aluminum in a limitless choice of colors. If your home leans toward Modern or Contemporary, we�ll streamline the garden window lines for a perfect match. 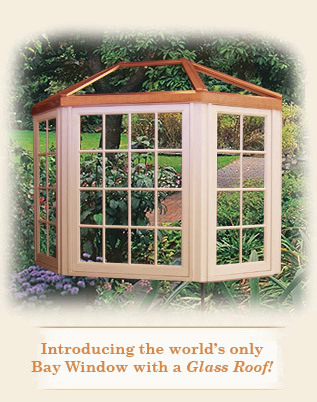 - Renaissance will fit your garden window to your window opening in a number of unique ways. We can stretch your window vertically and horizontally, adding volume to the window without increasing the opening size. Our clients often choose one of these methods to expand the size of their garden window, or to effectively alter the site lines. Our Garden Window Design Professionals can explain these options in detail. 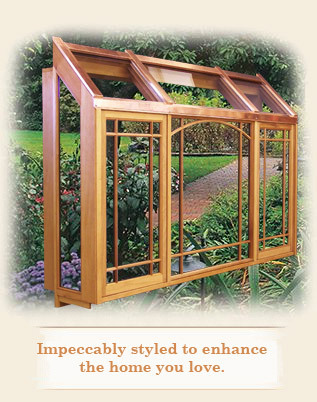 - Renaissance is the only garden window manufacturer offering an exclusive built-in Mounting Sleeve. Your mouting sleeve will be sized to fit your opening in width, height and depth. This unique feature makes our sleeve-mount garden windows incredibly easily to install and trim. If a sleeve-mount isn�t appropriate for your application, we offer an equally flexible Face Mount option. Either way, Renaissance has your installation needs covered. - Believe it or not, we have wrapped our garden windows around the corners of our clients� homes, eliminating the corner of the room, and effectively transforming entire walls into living, growing walls of green plants. In one instance we built a 12' wide x 9' tall Renaissance Garden Window which opened a good portion of our client�s town home wall. We have even built extra large garden windows to accommodate twin wall openings. - Garden Window Seats with book shelves are yet another way our garden windows and glass roofed garden bay windows can create exciting value added living space in your home. For one client, we transformed an existing breakfast nook window into a garden window seat, effectively adding two additional seats at their breakfast table plus room for all of their favorite plants. - Clearly, Renaissance�s glass roofed bay windows are singularly unique by rewarding our clients with the best of both worlds; a traditional bay window plus the added light of a glass roof. Add LIGHT to Your LIFESTYLE.